Increase odds of grafting success by changing the smell of the lamb. Also used with goat kids, calves and colts. Restrain the mother/foster mother in a chute or other apparatus. Cover foster mother's eyes with hand and generously apply Mother Up directly on the nose and mouth. Cover orphan’s eyes with hand and generously apply Mother Up on back and head. 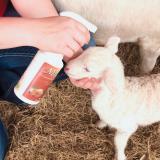 After application allow orphan to nurse. MotherUp will freeze, but the composition will not change. No special storage is needed, although the spray bottle may shrink or bloat when exposed to extreme temperatures. It is advised to avoid extreme temperatures to prevent leaking. If frozen, allow it to thaw and be sure to shake the bottle well before using. One generous spray-down application to both the mother and orphan will ususally unite the two. Occasionally, a repeat process is necessary in 12 hours.